Commuting | mGaadi - Go Places! It’s time to talk about the tag line on our logo. I was talking about mGaadi to a policy wonk friend (PW) some months ago. He shared his own auto driver story. The sheer ubiquity of the auto rickshaw in the Indian milieu is such that everyone has a story (or two) to tell about auto drivers. Here’s how I recall PW’s story. As we drove into the large gated apartment community, the auto driver (AD) got all wistful and said something on the lines of yeh sab humare naseeb mein nahin likha hai (translates to “all this is not in OUR fate”). In Abhijit Banerjee and Esther Duflo’s book Poor Economics, they refer to AD’s situation as being perpetually stuck in a ‘poverty trap’. In all our discussions with auto drivers and review of existing studies, what came through loud and clear was that the vast majority of auto drivers (around 70%) don’t own their livelihood vehicle. Many of them drive for decades and end up never owning a vehicle. The story of Mishra-ji is not unique at all. When I interviewed him last year, Mishra-ji was working as a security guard after ‘retiring’ from his auto rickshaw driver job of 24 years. We believe that vehicle ownership is at least a ‘necessary’ (but definitely not ‘sufficient’) condition to get auto rickshaw drivers out of their ‘poverty trap’. Increasing driver incomes, reducing “dead miles” and waiting time, adding determinism to daily incomes… these are some of the outcomes we are trying to achieve via mGaadi. The design patterns of our product aim to address commuters’ pain points as well as achieving desirable outcomes for drivers. We want both commuters and drivers to Go Places! We hope you’ll join us on this journey. For the past 2 years I have been commuting using Bus and Auto (mostly Auto to avoid crowds). My car sits in my garage and I take it out once in a while to keep the battery alive. In autos I have had more or less pleasant experiences chatting with the driver, discussing current events and philosophies and sometimes just minding my own businesses. Recently after experiencing the auto journeys in other states I came up with a conclusion that Bangalore Auto drivers are angels in comparison. When I shared this with some of my friends they all looked at me as if I am from Mars and recounted the horror stories of overcharging, rash driving, ogling, rude behavior and other irritating and some times criminal behavior. Although I could relate to their stories from my past experience long time ago, I realized that I have had absolutely great experience in the recent past. Then it hit me, over the last two years I have mastered getting good behavior out of ordinary ones and weeding out and avoiding the bad ones. So I sat down and thought about all the things I do and here is my commandments or auto protocol. Idea is to choose the Auto and not let the Auto choose you. Obvious ones like proper license plate, uniforms and other legal related signs are important. This is above and beyond that. Casually stand on the roadside without looking directly at autos, or approach the auto from the back. Observe the Auto, look for posters, writings, pictures, driver’s dress, mirror fitments, music boxes and what the driver is doing (reading, looking at people, smoking, chewing tobacco etc). With some practice you will be able to do this with finesse. 1) Religious Motif’s : If the driver has the Kumkum or Namaz topi, or Cross, it is usually very safe to take this auto. I have gotten 100 percent good behavior from such folks. 2) Movie Insignia : If the auto has pictures, or some form of allegiance to Darshan, Ambareesh, Upendra or Salman Khan avoid. If it has Shankar Nag, Rajkumar, Vishnuvardhan its a good sign. Strangely I haven’t seen too many heroin’s pictures. Picture less also indicates a very no nonsense mind. 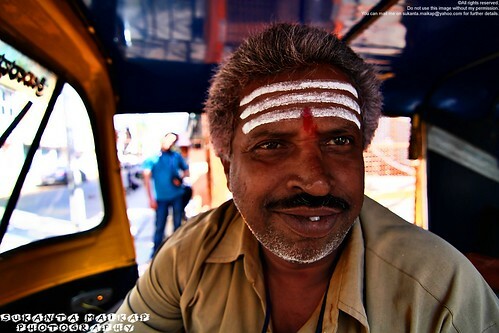 3) Age of the Driver : Middle aged auto drivers are usually very well behaved and cultured. They are from an era where social propriety was deemed higher than money. If the driver is dressed with Khaki uniform open like a coat and collars up etc, be cautious. Obviously not all young ones are bad, but look at him to see signs for unbalanced raw youth (what we call “Padde hudugaru”). (Some of the signs are explained below). 4) Writing on the auto wall : Many autos have very biased and anti women writings relating to movies, usually accompanied with a picture of knife and blood (Why do they allow them ?). This indicates the driver/owner has had bad experiences (Jilted love comes to mind) and they tend to be irrational, driving fast and basically being angry at everyone in traffic. So avoid. 5) Smoking, etc : If the driver is smoking, avoid, but he sees you and immediately quashes it that is ok you can safely take the auto. I also avoid tobacco chewing fellows as they constantly spitting on the road getting on my nerves and compelling me to lecture them and hence a possibility for confrontation. 6) Avoid auto stands (Not the pre-paid ones). They are usually in groups and you will be outnumbered and psychologically overpowered into making a wrong decision. My suspicion is, most of them are also local jaunts for jobless youth of that area. Go little ahead and wait for a empty moving auto. 7) Reading : If the driver is either reading news paper or tucked some news paper in his auto, thats a positive sign. They tend to be very well behaved and usually doll out oodles of moderate philosophy. 8) Music : If loud music is blaring the latest Item song, Avoid. If there are some nice mild songs or even classy FM go in. 9) Mirrors : Some auto drivers have a third mirror in front of them so that they can look at the passenger, presumably to hear what they are saying in terms of direction. But some are used to ogle at the passengers. So watch out for the angle. The mirror should be positioned in such a way that only if he looks up he should be able to see you. 10) Love/Lust signs : If the auto has love signs, picture of lips (usually on mirrors) and scantily clad women, obviously use caution. Use the 1-9 above to judge and balance this. Finally Speak in Kannada. Nothing softens and chastises them like matronly tone and some chaste Kannada words, like en Anna, en Appa, and if he is elderly, addressing them as Swamy (Koramangalakke bartira swamy ?). Using plural/bahuvachana (respectful prefix of bartira instead of Bartiya ?) would make huge difference as well. If you cant speak Kannada, using other languages with good soft tones and non threatening gestures will help. Disclaimer: Some autos are rented by the driver hence some of the logic may not apply, however it is always the combination of these factors. These guidelines are for me and my type of folks, rest need to customize it or discard it. Obviously this isn’t a scientific study and many are stereotypes created with my biases. But these are empirical observations which have worked for me. This is written with a need of self preservation, of peace of mind and dignity and not to offend anyone. Finally this writing assumes the driver to be a male as I haven’t come across a female auto driver yet in Bangalore. This was originally published in Manjula Sridharan’s blog, and republished here with her permission.